Sielox Pinnacle Access Control Software version 10.0.2 and AC-1700 Main Controllers with firmware version 19 support up to 16 Salto Sallis or 32 Schlage wireless locks in addition to the two hard wired doors/readers provided by the controller. New Pinnacle Schlage WiFi integration can control an unlimited number of Schlage NDE and LE wireless locks using the building’s existing WiFi network and without the need for controllers. Wireless locks solutions are an effective technology that dramatically reduces installation costs of traditional hard-wired access control doors by incorporating the Lock, Request to Exit, Door Status Switch and Reader in one complete package. Installation of this wireless door package virtually eliminates the need for wiring while recognizing significant time-saving installation on a typical door – usually in less than an hour. NDE and LE wireless locks are integrated into popular electronic access control systems from Software Alliance members to bring the benefits of EAC deeper into the building. The NDE design packages the cylindrical lock, credential reader, and access control sensors together into a small footprint that is both easy to install and affordable. NDE enables the use of both proximity (125 kHz) and/or smart (13.56 MHz) credentials which feature a much higher level of security and versatility. The LE design packages the mortise lock, credential reader, and access control sensors together into a small footprint that is both elegant and affordable. They feature two sleek trim options with a broad range of decorative lever choices. The LE mortise chassis can be ordered with an interior push button or deadbolt for specific applications. Capability includes the use of both proximity (125 kHz) and/or Smart (13.56 MHz) credentials which feature a much higher level of security and versatility. 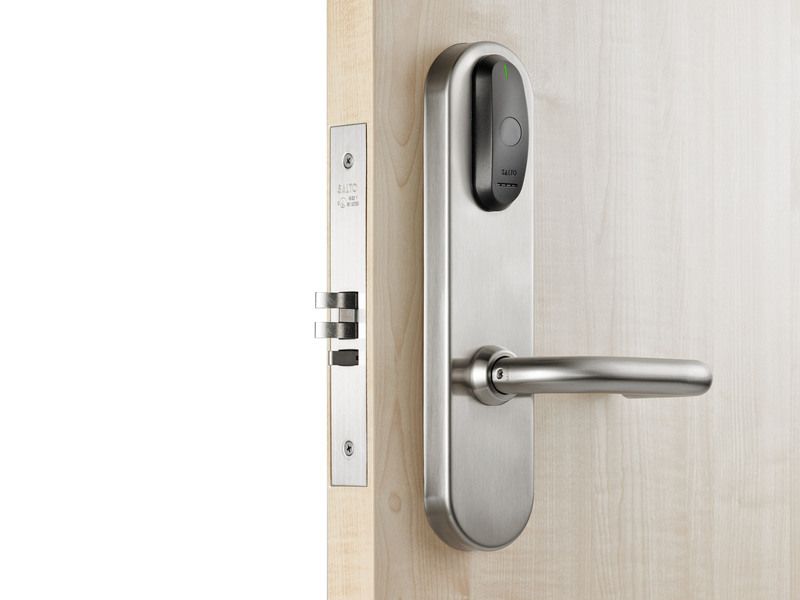 Schlage AD-400 Series wireless locks seamlessly integrate with Sielox Pinnacle Server to provide a cost-effective and scalable access control solution to meet your security needs. Schlage AD Series locks combine the components typically found around the door, such as the door position switch and the request to exit switch, into one unit which simplifies installation and saves money. And since they are designed to be modular, Schlage AD Series locks can easily be upgraded in the future to meet your changing security and technology requirements. Schlage AD-400 Series wireless locks make use of secure 900 MHz wireless communication, AES-128 bit encrypted, and are powered by four standard off-the-shelf AA batteries. Von Duprin®’s Remote Undogging (RU) and Remote Monitoring (RM) options are designed for doors that would typically go unaddressed with traditional access control solutions due to cost and complexity. They provide the right level of features and functionality for the application and compliment traditional solutions to deliver a more comprehensive security package. These flexible and scalable options enable you to cost-effectively upgrade existing devices. The RU and RM are battery powered kits that retrofit existing 98/99 and 33A/35A devices. They connect wirelessly to the integrated Sielox Pinnacle access control system to eliminate the need to run wires to each opening.